Wedding ideas don’t get any more adorable or more creative than this rustic bohemian shoot at The Honey Farm in Dayton, Ohio! The Midwestern fields and industrial barn set the stage for honey-themed inspiration in a rich gold and navy blue palette, along with modern geometric honeycomb decor, and colorful summer flowers from Floral V Designs! 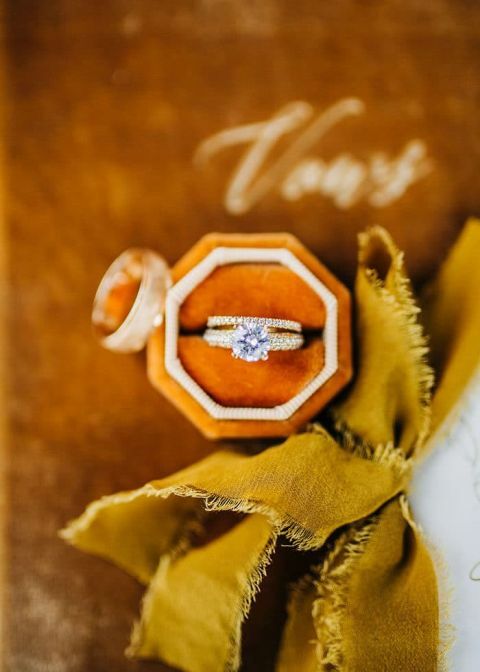 This gorgeous editorial shoot from Emma McMahan Photography and Lost and Found Vintage Rentals is just as sweet as honey! 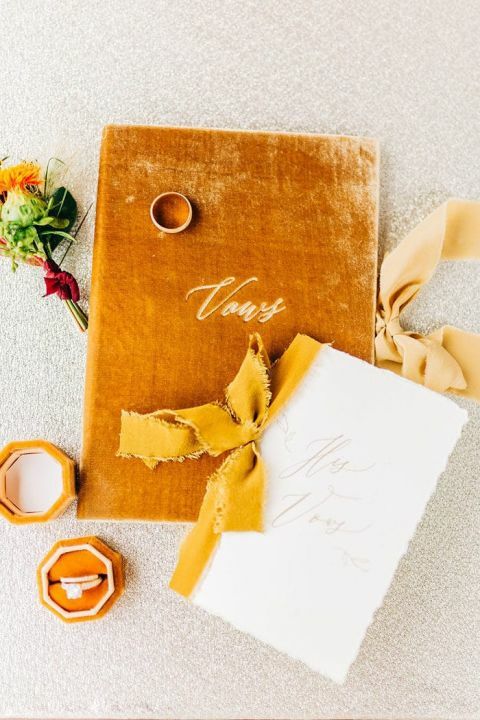 Dusty gold velvet details played off the honey theme, thanks to the vow books from Elmo Paper Stories and engagement ring box from The Family Joolz. The gorgeous bride was the picture of rustic bohemian style in a lace and tulle A-line wedding dress from Lace Bridal Couture. 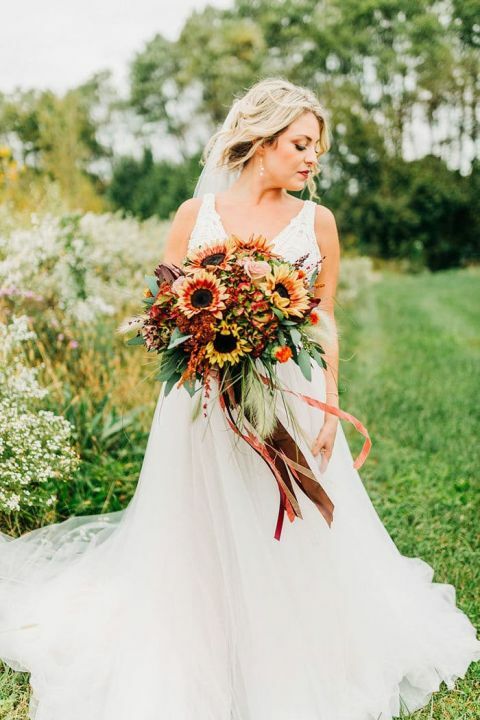 Floral V Designs created a gold bridal bouquet of sunflowers, dahlias, and lavender to add the signature color to the bride’s look. I love this equally chic look for the groom, with a navy blue velvet suit jacket and and aubergine pants from Hellmans Clothiers. It’s not often you see a groom get so colorful with his wedding day attire, but hopefully this look will inspire gentlemen to kick things up a notch! The cutest little flower girls in dresses from BoChic Bridal Boutique danced their way down the aisle of vintage Persian rugs, to the geometric wedding ceremony backdrop. Colorful fall flowers echoed the bride’s bouquet on the honeycomb shaped arbor. The red barn at The Honey Farm created a dramatic setting for the reception, with farm tables from Kosins Tent and Events set with beehive decor and floral runners of greenery, goldenrod, and wild daisies. 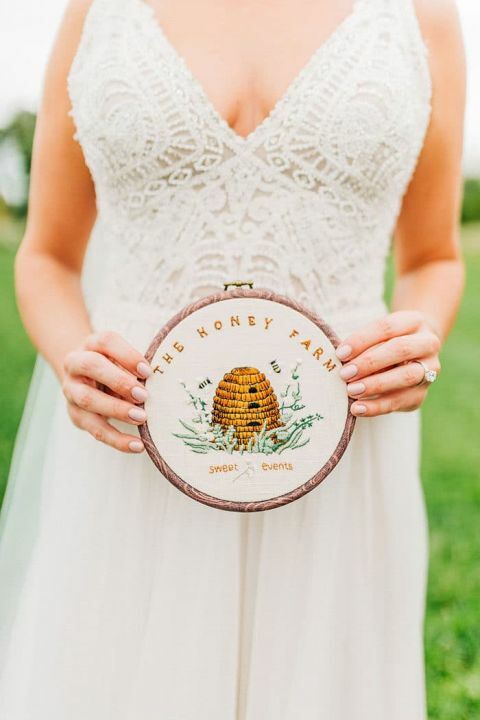 Individual honey favors and honeycomb inspired chargers by Fox Wedding Designs created a chic nod to the them of the event! Things took an adorable turn at the Kid’s Table, with custom activity allow for coloring, and beehive inspired cupcakes topped with sugar bees! A vintage pickup truck served as the perfect dessert display, with an assortment of Southern inspired pies! The pie buffet replaced a traditional wedding cake, with a donut wall and custom stamped marshmallows for a S’mores station! I love these stamped bags from The Favor Loft to let guests take donuts home with them as a sweet reminder! The industrial silo turned into a bar for wedding, with a wrought iron chandelier to complete the farm chic reception. The farm’s ponies, Lucky and Honey, serve as ‘unicorns’ for special events, but were able to make an appearance as their own happy go lucky selves for this sweet shoot!